Monday Mornings!!! I dont know why but these days i am loving weekdays more than weekends. Weekends are kinda boring same routine watching movies, eating and sleeping. i need a change. Anyway as weekdays cheering me up these days and today morning was so beautifully foggy and with wintery feeling I loved it as i didnt have to go to work unlike hubby :D.
Today i am showing you another Indie.. you all must know by now that i am in love with indies these days so here is Sugar Daddy from Lush Lacquer. Lush Lacquer is custom blended polishes by Karin and Lexi, mother-daughter duo :). "our polishes make perfect party favors for Halloween parties, baby showers, birthday parties, events, x-mas parties (secret santa gifts) and just because..........they are perfect gifts for your hairdresser, doctor, manicurist, mail lady, secretary, best friend, teacher, school administration.....etc.....the list is endless...we have something for everyone! Sugar Daddy is 2 coat opaque white base polish with yellow, red, green, blue, purple, orange medium hex and bar matte glitters. This is a perfect rainbow glitter polish in white base. here i used 3 coats of the polish. this polish is so so beautiful and now my most favorite white base glitter polish. Lush Lacquer have wide range of glitters and their polishes costs $8.75 for 15ml bottle. 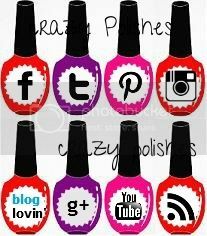 They also stock minis and pack of mini polishes. They do ship internationally. You can also contact them on their Etsy Shop and on Facebook Page. Hope you will like this polish as much as I do. Reminds me of confetti cake! Yummm! :) :) yeah it is . i love this one..need to buy..